Investment opportunity in Cambria. Kingston Bay is offering its 1.25-acre site in Cambria, California for sale. The property is zoned for multi-family and consists of 7 contiguous parcels. The property has been designed as a 31-Unit, 41 bed assisted living and memory care facility. However, there is no restriction on project type as long as it falls within the allowable uses of the RMF zone. The subject property is uniquely positioned for development in a significantly under served and affluent market. 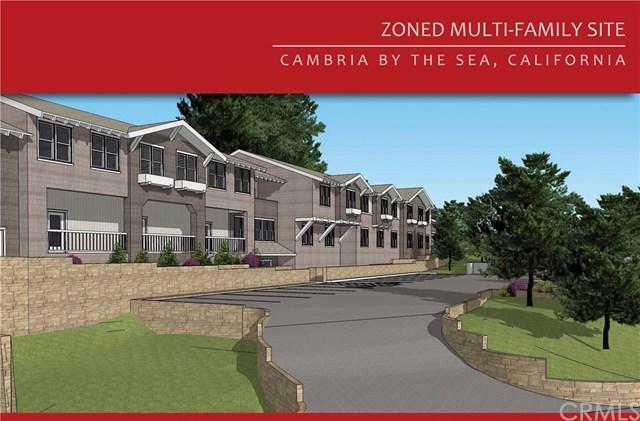 The community of Cambria-by-the-sea is located on California+GGs central coast between Morro Bay and San Simeon. Housing in this area is scarce and professionally operated senior housing, specifically assisted-living & memory care is non-existent. It has secured 11.78 EDU+GGs of water, through prior payment of a water conservation fee. The parcels hold the Number 1 and Number 9 community utilities district+GGs wait list positions for new water connections. People+GGs Self-Help Housing also owns zoned property in Cambria, possesses a Will-Serve letter and holds District Wait-List positions for a housing project. Thier project of 33 affordable housing units was approved by the San Luis Obispo Planning Commission on January 10, 2019. Broker Jeff King has an ownership interest in this listing. Possible Use Comments Multi Family 7 Parcels Two Homes On Each Etc.